Why would you want to take up sword fighting with your spouse? We don’t want to sword fight against our spouse, we want to sword fight with them on the same team. The Apostle Paul tells us that we have a weapon that can devastate satans strategies against your marriage. In the Greek, this word “sword” is MACHAIRA. This word “machaira” is important because it was a special kind of sword. There are a variety of swords used by the Roman soldiers. The “machaira” was able to painfully shred the insides of it’s victim because it was used like a corkscrew. It was a razor-sharp deadly and frightful weapon. Just like this particular sword brought terror to the imagination of the enemy, the “sword of the spirit” torments the devil. When the enemy starts to intervene in your marriage, get quiet in your heart and listen to the Holy Spirit. The Holy Spirit will give you a Rhema (word) to speak at the devil. This is close combat and a time to use your sword. You use it like a corkscrew; Insert, Twist and do Damage! Gods word stays dormant in your heart till you let it come out of your mouth, then it is a two-edged sword. “Logos” is the written word of God. “Rhema” is a quicken specific word from the Spirit. The Holy Spirit teaches us to use it offensively and defensively. We should earnestly study and practice sword exercise as Jesus did in his conflict with Satan and with the scribes and the Pharisees. Sword practice in your marriage is allowing the Holy Spirit to supply, inspire and employ Gods word (machaira). CASE AND POINT: Japanese sword training is something of a lifelong journey. Even the masters consider themselves to be humble students, constantly striving for perfection and always feeling that they can execute a cut cleaner, faster and with more precision. 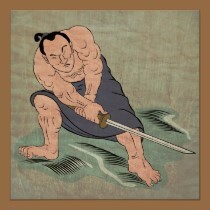 In traditional Japanese sword training, techniques are often practiced many thousands of times before any degree of proficiency is obtained. Do you have a good grasp of Gods word and know how to apply it with precision? God’s word can be an effective weapon when attacks come against your marriage. Don’t use a plastic toy gun!!! We need to use specific scriptural truths to counter satanic falsehoods. Insert, twist and do damage! !